This blog is a salute to awesome vintage goodness like vintage Hollywood, music, flea market, garage sale and thrift store finds, and more. Enjoy! If you like what you see please support my store http://www.tshirtfort.com/ Thanks. They say it might snow near sea level for real. In my life this has never happened in the bay area ever.OMG I want it to snow soooo bad!!! I want real snow that sticks on the ground that you can play in and take photos of. Real snow not sleet. Nobody even knows what that is. Uh yeah the Gap again. Remember the hub-bub about the Gap's logo redesign? Apparently they ditched the ugly new font about 2 seconds after adopting it. They did however redo the Gap store near me to make it even less appealing and full of even more clothes with zero personality. Whatever. The Coolest Retro Stuff Ever! In a retro shopping mood? Then take a look at some of the best retro stuff from all over the lens at this website. ">The Coolest Retro Stuff Ever! There is plenty of stuff for swingin hepcats, rockabilly lovers, cheeky housewives, tortured troubadours, hopeless romantics, dad dad daddy-os, sassy pin up girls, route 66 fanatics and more. Merry Christmas here is a FREE gift from my website www.tshirtfort.com! It's that time of the year again yes it's the re-gifting season and what better way to re-gift than in style at a white elephant party. Do you often get invited to white elephant parties but your gift doesn’t stand out and always gets picked last? Here is our gift to you a free pdf of white elephant wrapping paper. Just print out as many sheets as you need and wrap your present or use it to cover up a generic gift bag and give it that white elephant flair no one else will have. Feel free to use it and tell your friends about this link and the T-shirt Fort, but don’t re-distribute this pdf or try to claim it as your own. Also don’t try to sell it. It’s a free gift. Hey Kids Remember The Gap? Did you know the Gap as an ugly new logo? I’ve been seeing a few complaints on the web about it but my only response is when was the last time anyone actually gave a crap about The Gap? I remember it being mentioned (negatively) in the movie Reality Bites and I remember that David Spade used to play a Gap employee on Saturday Night Live but really the Gap hasn’t been culturally relevant since approximately 1996. Even when the Gap was popular I didn’t understand it. It was full of those boring khaki pants you could get anywhere and piles of ho hum sweaters plus it unleashed cargo pants upon the world. God how I hate cargo pants. They flatter nobody and who wants to put some bulky crap in your bulky pants that will make you look even more bulky? The only store I get the appeal of less than Gap is Banana Republic which is just a Gap featuring Gap clothes that cost 50% more than those at the Gap. Sometimes when I am at the mall I will stop in the Gap because it’s there. (And I will give them this their Dream perfume is alright. Nice and light, it doesn’t smell like some super sweet grandma perfume nor is it endorsed by a celebrity who I can’t stand.) 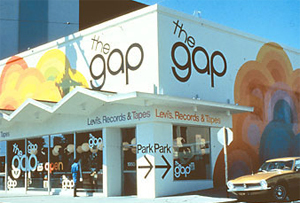 I can’t imagine gong out of my way to go to a Gap that is I couldn’t until I saw a picture of the original Gap. Look you can get Levis, and Records and Tapes! Plus look at all the groovy orange clouds painted on the side of the building. Also the original Logo doesn’t look that out of date even though its from 1969 or something. I think if Gap wants to be cool again they should just go back to this plan. Especially since its so hard to find a decent selection of records and tapes these days. Note: I snagged this pic off the web ages ago cause it intrigued me. I don’t know who took it or where its from (flickr possibly). So sorry about not properly attributing it. New Posts coming I swear! So I have been doing with this blog what I have done with a few others. Let it get so stagnant. Yes I am pretty sure I am the first person to ever let a blog sit on life's proverbial back burner. Not. Anyway It's been on my mind and I am so coming back. Though I have decided the posts may not always be 100% vintage related but I will try to somewhat stick with the theme. In the meantime go back and read my post about the haunted National Geographic. I still think it's spooky even though the rest of the world does not care. Should have used the the keywords jonas bieber twilight I guess. Asta la pasta smell you later. Do you ever go into a Goodwill and see what was once obviously someone’s beloved collection just sitting together on a shelf. This always makes me sad because I think that whoever had the collection died and their family just donated it all. Couldn’t they have at least saved some of the choicer pieces to remember uncle Jim or Grams? Once I saw just tons and tons of cute vintage salt shakers and yesterday I saw a collection of shot glasses from touristy places. Now its not like this was a collection of taxedermied squirells dressed as presidents or something. Salt Shakers are useful, shot glasses are useful so come on even if you don’t drink you can stick a candle in them or something. I guess the world has just become too disposable no one has room for memories anymore. Everyone just lives in crappy apartments and all they buy is basically put it together yourself disposable furniture from Ikea and Target so when they move half of it just ends up by the 47 vacuums and an exercise bike sitting by the complex dumpster. No wonder pretty much every furniture store is going out of business. Or maybe they are the same people who give away whole albums filled with family pictures to thrift stores. I’ve seen this too. Who would do that? Do you hate your family that much? I don’t know why I notice when the rest of the world doesn’t. I’m too sensitive. The world says this is a bad thing but its always been the way I am wired. Oh well. I design some of the funniest t-shirts on the web and make them available for purchase. You don't need to vote for them in some contest and the one you want is not out of print.